You are also invited to join us the 1st Lord's Day of each month for our fellowship meal after the Morning Worship service, with Communion after the meal. 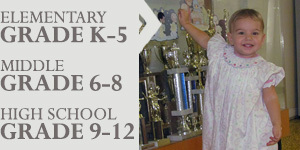 New Hope Christian Academy has served the St. Marys/Kings Bay, Georgia area for over 35 years. Our purpose is to provide an excellent, traditional education with a Christian emphasis. We show students from K-3 through the 12th Grade how Biblical truths can be applied to all facets of their education and life.